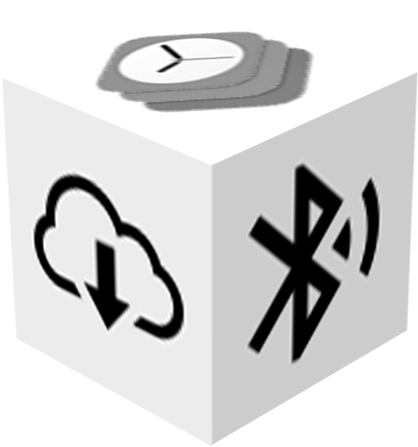 Fixr is a multi-platform (Web, iOS, Android) automotive solutions app. 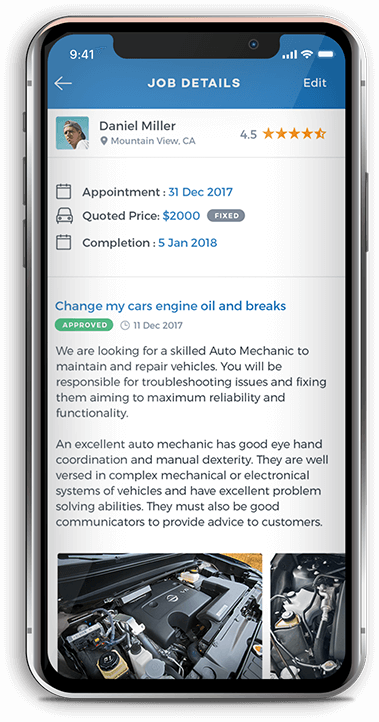 Registered users can post car service job requests, receive quotes from agents, compare them, and avail the services of the best car shop/mechanic. The Fixr app is all about giving more options to people on the lookout for auto mechanics. People do not have to get repairs done from the very first car shop they come across. With our app, they can check out quotes from several agents, and arrive at informed decisions...decisions that are best for themselves and their cars. As long as a car is purring along nicely, all seems hunky-dory for the person behind the steering wheel (or the car-owner). Things can, however, quickly go pear-shaped - in case of a breakdown or a mechanical glitch in the vehicle. Searching for good professional automobile mechanics can be a frustrating and time-consuming experience - both when there are not many car-repair shops nearby, as well as when there are too many to quickly decide which one would be the best. Fixr is a unique web and mobile application that ‘understands’ this need of vehicle owners, and brings high-quality car services to the users’ fingertips. Literally. 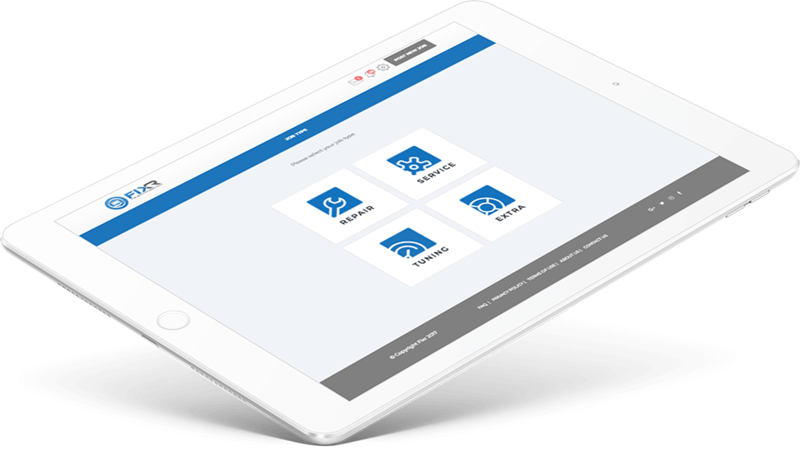 Fixr is, in essence, a holistic and user-friendly automotive solution app, designed for users in Australia and New Zealand. It allows users to post detailed car service job requests - as a response to which mechanics/agents can send their quotes. Car-owners can compare such quotes from multiple agents - and decide which one seems the best-suited for the car repair job at hand. Once the app quotes had been sent by us and the client finalized Teks as the app development partner, work on Fixr started in right earnest. This was easily one of the most exciting, and most fulfilling, apps we created in 2017. Which Platforms Are Fixr Available On? The best of cars can develop snags and glitches - and in the hands of the wrong mechanics, the performance levels can be affected in a big way. 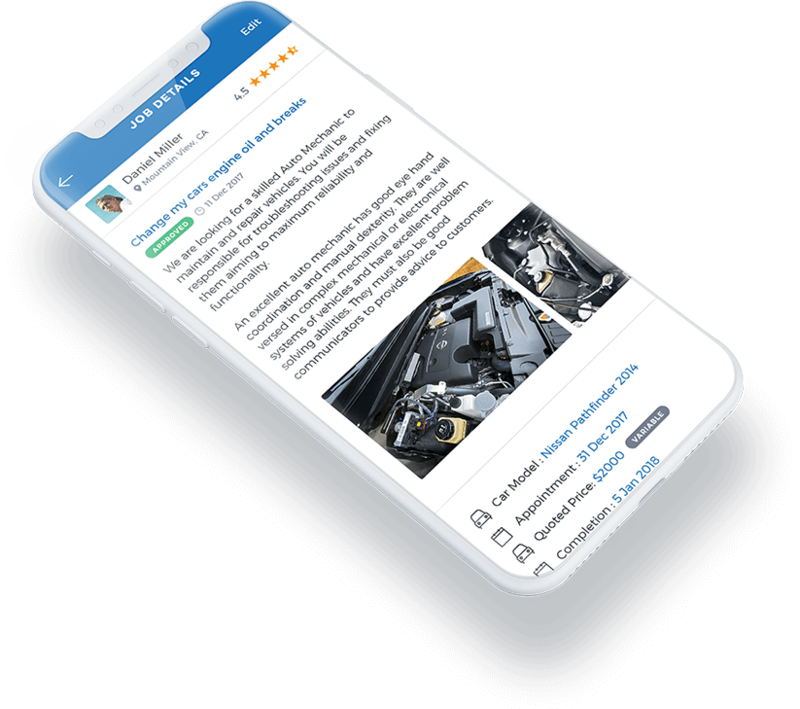 Fixr is a one-of-its-kind application for finding automobile service providers...and I firmly believe that users will find it very handy indeed. To ensure optimal visibility and access to vehicle-owners across New Zealand and Australia, Fixr has been made available for both the iOS and the Android mobile platforms. In addition, we have also created a responsive web portal for the app as well. 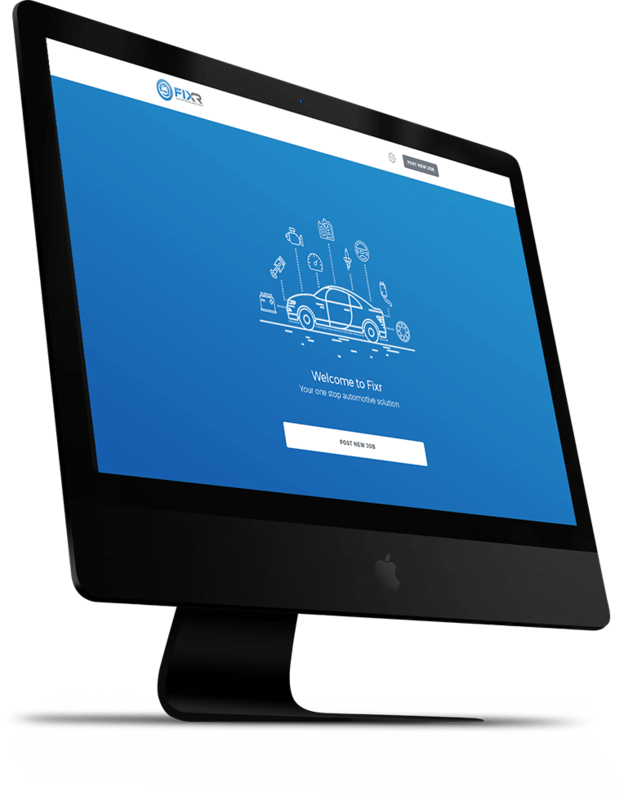 Users can login and start posting car job requests from any device, and from anywhere. How To Get On Fixr? Easy onboarding is one of the high points of this new car service application. New users can register themselves by either using unique email/password, or with their Facebook credentials. We had to make sure that people could quickly start searching for mechanics on the app. Bothering them with lengthy registration forms and permission requests would have been a bad idea. When I use a mobile app to look for a car repair shop, it’s evident that I need the information fast. Chances are, I will not have the time for...or simply not be interested in...lengthy sign up forms. Fixr is great in that regard...just sign in with your email or FB, and you’re ready to make job posts. A person can join Fixr either as a vehicle-owner (‘User’) or a car service provider (‘Agent’). The app serves as a seamless, efficient platform for the former to connect with the latter, to get repairs done quickly and effectively. What Are The Job Posts On Fixr? You need a service...so you put up a classified ad...and several service-providers respond with their price-quotes. All that you have to do is compare the quotes and select the most suitable provider. Fixr works on the same broad principle. Users can post detailed car job requests, and agents are going to respond to them. 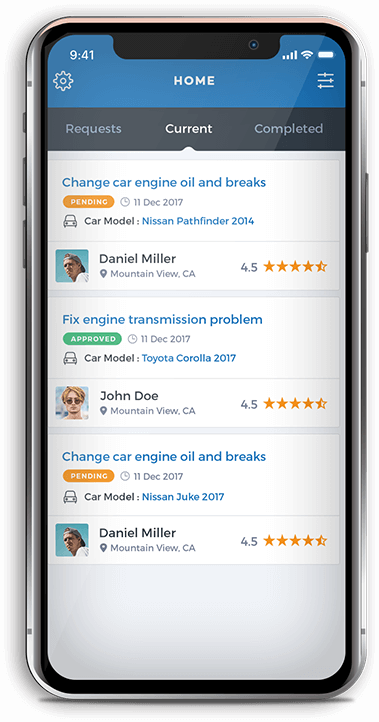 To make sure that car-owners/users can indeed connect with the most suitable mechanics/agents, job postings on the Fixr app have to be detailed. Users have to provide a self-explanatory job title (e.g., ‘need to change brakes’) and a brief description of the job. The job location also has to be provided (it might very well happen that the user is at a certain location, but the vehicle is at some other place) - along with the desired completion date and offered/quoted price. There is the option of attaching relevant HQ photos as well. Finding a car model before posting a job is also pretty straightforward. Users can quickly look up their automobiles by searching with the vehicle registration number (Rego) and vehicle identification number (VIN). Fixr makes sure that users can find all types of specialized car services with absolute ease. A new job post is included under one of the four categories - Repair, Service, Tuning, and Extra. There is no way of predicting what type of car repair becomes necessary at any point...and this app keeps you prepared for all chances. How Are Job Posts Managed On The App? All the job posts that a user uploads on Fixr are stored under the ‘My Jobs’ tab. The app stays true to its promise of delivering greater flexibility and choice to car-owners, by allowing a maximum of 10 agents to reply to a job post, with their quotes. People can compare the received quotes, and approve the one that is most well-rounded. Managing the large number of car job posts is something that Fixr manages with quiet efficiency. Posts are - depending on their respective status - clubbed under ‘My Jobs’, ‘In Progress’, and ‘Completed’. Jobs that are already taken up by an agent (but not yet completed) are moved to the ‘In Progress’ tab of the app. A repair job is marked as ‘Completed’ only when the agent/mechanic finishes the task, and the user confirms the same. A person can have multiple open job posts at any time. Fixr enables car owners to decide which repair shop to contact for the required services. It’s just like going to a supermarket while looking for a particular product...when you have more options, you can do your very own comparisons and take decisions based on figures and logic. Why rush to a decision when you can check out alternatives? Apart from the prices quoted by the different agents for the same job, a user can also compare the overall reviews and ratings of each agent. There is a real-time chat feature available as well, for preliminary discussions. The appointment date and the date of completion are also mentioned in the quotes. Once a user finds a quote that seems satisfactory, (s)he can ‘approve’ it. The concerned agent will receive a notification immediately. The chat option remains available even after a job has been marked as ‘completed’. Users have to provide a rating to the agents, along with an optional feedback. Agents listed on Fixr are verified - and vehicle-owners can rest assured of getting the best possible car service. What’s There For The Agents On Fixr? 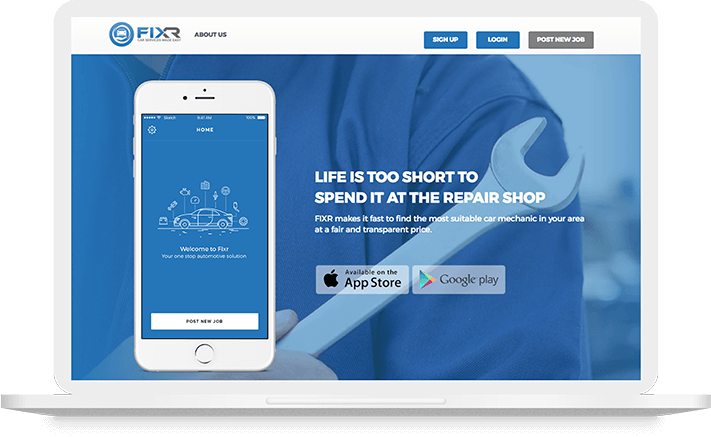 Fixr doubles up as an effective digital job-search platform for professional automobile mechanics. Agents can quickly browse through a large number of job posts (listed by car owners) - and track jobs that are either ‘in progress’ or have been completed. Jobs can also be filtered on the basis of physical distance and the precise nature of the job (services, tuning, repair, etc.). Just like it does for vehicle owners, Fixr offers customized options for the registered agents. They can browse jobs and apply to the ones that they are interested in. Agents can mark some job posts as ‘not interested’ too. The mechanics get to decide which repair jobs they would take on. The quotes sent by the agent needs to contain (apart from the exact price quote or estimate) the proposed appointment date and the date of completion of the concerned tasks. A quote can also be edited by an agent, before a user ‘approves’ it. In case a user declines an agent’s quote, the message is sent within a red bar to that particular mechanic. Reviews on Fixr are a two-way thing. Just as car owners can review agents, the latter can also rate their employers. Rating a user...along with a description...is a one-time thing. As already mentioned, the Fixr app has real-time messaging options, facilitating conversations between users and agents. Notifications are sent to vehicle owners as and when an agent bids for a job and/or sends along a chat message. When quotes are approved, the concerned agent gets a notification.In addition, bulk messages can be sent by the admin (from the backend). Note :Notifications can be toggled to ‘off’ from the ‘Settings’ screen. There is a dedicated FAQ section as well.